Elliott Electric Supply was established in 1972 in Nacogdoches, Texas and has grown to over 140 locations in Texas, Louisiana, Arkansas, Oklahoma, New Mexico, Georgia and Kansas. Click video to play, or download it here. Bill Elliott, our company's founder and current chairman, first entered the electrical distribution industry after graduating from Louisiana Tech University in 1960. He worked for Powerline Supply Co. in Bossier City, LA for twelve years, during which time he became manager of the company. In 1971, Bill began looking for a place to start a company of his own, and it wasn't long until he and his wife, Micky, discovered the town of Nacogdoches, TX, which had no electrical supply house at the time. With an $80,000 small business loan and $20,000 of his own money, Bill put the beginnings of Elliott Electric Supply into motion. He built a small facility on the south side of Nacogdoches (which remains in business today as "Store #1") and purchased $60,000 in inventory. Company personnel at this time consisted of Bill, Micky, and Jack Sandifer. A short while later, Rick Moehring, the company's third employee, joined the crew while earning his accounting degree at Stephen F. Austin State University. Rick's roommate, James Rudd, also came aboard. Rick Moehring retired from the company as the Nacogdoches area manager, and Rudd retired from the company as a Product Category manager, both after 40 years of service. The first year of operation was a success, with around $400,000 in sales, resulting in a small profit that could be reinvested into the company. By continuously reinvesting in the company and expanding our business presence, we maintain our goal growth rate of 15% annually, effectively doubling our size every five to six years. 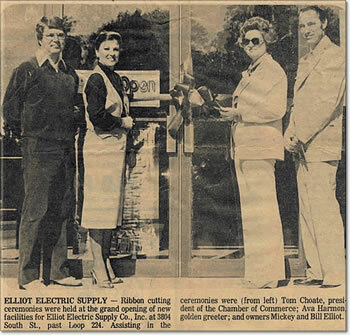 Since our beginning in 1972, Elliott Electric Supply has kept a compounded growth rate of 20% on average. We feel that growth in our company is beneficial for more than just EES employees--our expansion also benefits our customers and the industry as a whole. In meeting our annual goal of 15% growth, we strive for half of the growth to come from expansion of existing markets and the other half to come from new locations. During challenging economic periods, Elliott Electric Supply's business model ensures that the company not only survives but thrives. 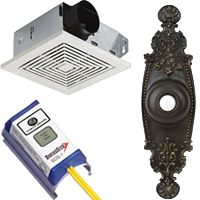 Our financing is primarily internal, and, at half the industry average, our debt rate is uncommonly low. We are therefore often in a position to invest when other companies are not. Additionally, our customer base is well balanced, with residential and commercial-based clients as our primary market, supported by business with industrial, institutional, and government-based clients.